When winter set in, Sherie realized how important hair really was. Not having it posed issues greater than aesthetics––her head was cold! But, rather than sporting any old head garment, she and long time friend Cathy Ekerson decided to make customized fleece hats. They adorned the back brims with strands of dangling beads to represent hair. Figuring other women might be interested in wearing these cozy, symbolic hats, Sherie and Cathy established the business Hats of Empowerment. Wanting the sales proceeds to help fund research and awareness for ovarian cancer, Sherie and Cathy learned that the Oregon Health & Science University (OHSU) had a laboratory specializing in gynecologic cancers. At that time, there were no other organizations delivering continual funding to this lab. So came the bright idea to form a foundation. 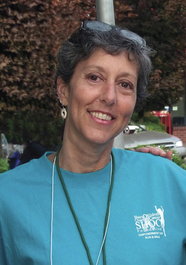 The Sherie Hildreth Ovarian Cancer Foundation was established in the summer of 2005. The SHOC Foundation is a multifaceted fund-raising organization. In addition to raising funds for ovarian cancer research at Oregon Health & Science University (OHSU), the SHOC Foundation also works to increase public awareness about the disease and connecting survivors with the resources to assist them on their journey. The Foundation primarily serves women in the greater Portland area, but is always available for guidance to anyone coping with gynecologic cancer regardless of their location. The first ever SHOC fundraiser was a fun run & walk event during the summer of 2005. Now called the SHOC Walk & Run, formerly Empowerment Day, this event is the foundation’s largest and most successful fundraiser. Throughout the past nine years, numerous other fundraisers have taken place, such as auctions, dinners, luncheons, wine tastings, bingo and Mah Jongg competitions, fishing derbies and bottle drives. In the fall of 2009, SHOC became a member of the OHSU President's Society. Membership into this society recognizes the special partnership between the SHOC Foundation and the University. As a member of this society, SHOC has access to valuable resources, such as OHSU personnel, doctors, scholars, influential leaders, special events and promotional opportunities. The SHOC Foundation is currently a Silver Medallion level donor. Medallion levels are determined by gifts donated over a lifetime. In its 12 years, SHOC has donated $900,000 to the Gynecologic Cancer Lab, headed by the devoted Dr. Tanja Pejovic, at OHSU’s Knight Cancer Institute.